Jeremy Corbyn wants to see "incontrovertible evidence" before blaming Russia for the poisoning of an ex-spy and his daughter in Salisbury. 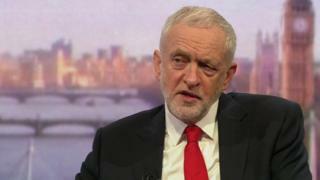 The Labour leader said it was "clear" the nerve agent used was "very similar" to those made in Russia - and Moscow should be challenged about this - but "absolute" proof was still needed.He also said the international chemical weapons watchdog needed greater powers. Boris Johnson said to deny Russian involvement was "quite extraordinary".Russian ex-spy Sergei Skripal and his daughter Yulia were found slumped on a park bench in Salisbury on 4 March. The government says they were exposed to a military-grade nerve agent belonging to the Novichok group, and accuses Russia of being behind the poisoning. Russia denies any involvement.On Thursday, the Organisation for the Prohibition of Chemical Weapons (OPCW) said it agreed with the UK's findings on the identity of the nerve agent. The UK's national security adviser has since said that Russian intelligence agencies targeted Ms Skripal's emails as early as 2013, and that Moscow trained "special units" to use nerve agents. In a letter to Nato, Sir Mark Sedwill also accuses Russia of testing assassination methods with chemical weapons, including using nerve agents smeared on to door handles.When asked on the Andrew Marr Show what it would take for Mr Corbyn to agree that the Russian state had committed the attack, he said: "I want to see incontrovertible evidence of it. "I am appalled and alarmed at the idea that anyone would use this nerve agent and clearly it was an attempt to murder the Skripals on British soil. "Sadly it's not the [OPCW's] job to identify who made it or necessarily where it was made. I think we do need to strengthen the role of the OPCW in the future." When asked whether he agreed with Shadow Chancellor John McDonnell that the poisoning was a state-sponsored assassination attempt, Mr Corbyn said: "If we're going to make a very clear assertion like that we've got to have the absolute evidence to do it." 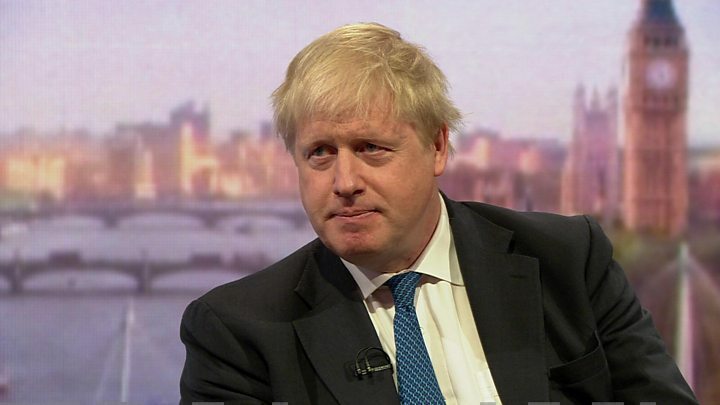 Mr Johnson, also speaking to Andrew Marr, said: "To continue to deny the likelihood of Russian involvement, of a state-sponsored assassination attempt, I think is quite extraordinary. "He added that it was a "blindness to reality that I find very perplexing, a defiant refusal to accept the Kremlin was responsible for this". The Skripals are thought by police to have come into contact with the nerve agent on the front door handle of their home in Wiltshire. The Skripals and Det Sgt Nick Bailey - who was exposed to the Novichok when he was tending to the Skripals - were all treated at Salisbury District Hospital.The police officer and Ms Skripal, 33, have been discharged. Mr Skripal is "still seriously ill" but his condition is said to be improving. Areas of the city were cordoned off as special investigators collected samples to test for the nerve agent. On Sunday, the Bishop of Salisbury will host a "service of cleansing and celebration" to symbolically reclaim the city for the common good.